During my time in Cambodia, I was so impressed by the beauty of the country and its people that I felt like I had to do more than just spend my tourist dollars for some handmade souvenirs. I decided that I would spend some time at an English language school and talk to them about my life in the United States and Canada. 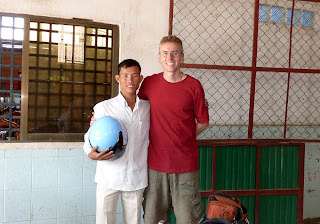 I was invited to spend some time at Savong's school which was established in 2005 when Svay Savong was only 24 years old. Incredibly, the school has 450 students and there are no fees for the classes. 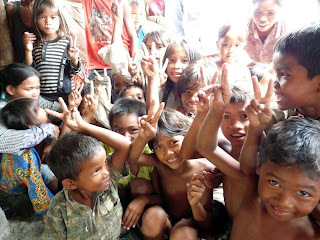 Although I only spent a couple of hours at the school, Savong invited me to visit a remote village on the weekend. I agreed and two days later, I was sitting on the back of a motorcycle driving through thick mud, avoiding cows and wondering where in the heck I was going. I bought a case of noodles with me and the other Cambodian men (there were five of them) took along some books, pens, pencils and a rubber ball. 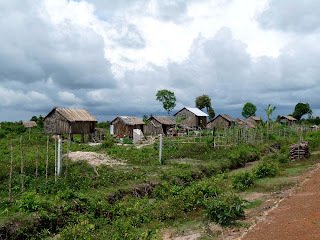 After an hour, we arrived at the village of Srass Kvaw. The name in Cambodian appears below. I think I was the first foreigner they had ever seen. The whole village, it seemed, came out to greet me with hands clasped in prayer and bowed heads. 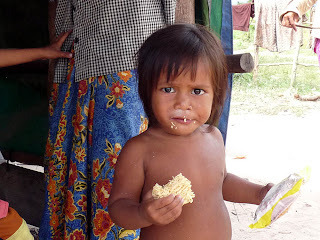 The noodles were quickly divided up and some of the children didn't even wait until their meal was cooked before they started chowing down. Hmmm, just a little dry perhaps? 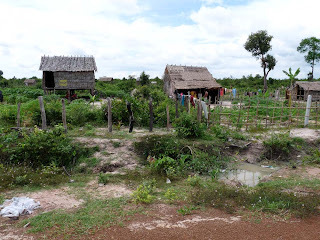 There are 62 families and about 171 people in this village which is located about 40 km from Siem Reap, in northern Cambodia. With translation, I told everyone how happy I was to visit them. It felt a little strange, as if I were a missionary back in the 1800s visiting Africa for the first time. The kids were especially welcoming. They loved having their pictures taken (and I loved taking them) and they nearly went insane with surprise when they saw themselves being played back on my video recorder. But this village is incredibly poor. And I mean poor. They have nothing to speak of. They don’t even have fresh water. 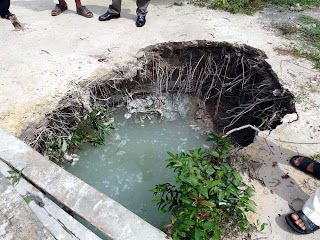 This pit is their water supply. Yes, this is the water that they drink. After seeing this village for myself, I couldn't help but be affected by the experience. All the people (except for one older lady) agreed that the village needed water pumps. The older lady told me that she wanted a mosquito net but I’m pretty sure that she wouldn’t complain about a supply of fresh water either. The cost for a water pump is about $200 and ten are needed for a village of this size. Mosquito nets and water jars would also be of great help but a supply of water is the top priority. I would like to raise money for them. I HATE HATE asking people for money but this cause is something that is just too important and the dry season is now upon them. I have included a link to a paypal account for any donations and of course, even the smallest amount is going to help. My contact for this village is Savong and I know that he will use the money directly for this village and get the pumps built. 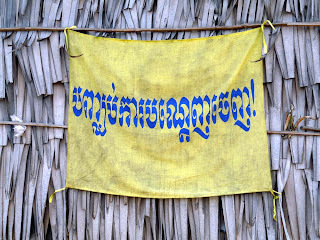 In Cambodia, the government is no help (corruption exists at all levels) and no social welfare system exists. The only help these people will get are from foreigners such as ourselves. With any donation: I will give free veterinary advice via email at oguk45@gmail.com. If you don't need veterinary advice, then I can offer other advice. Just ask! With $150 donation: You will get a 2009 calender made with my truly awesome photos taken during my trip to Cambodia. I will pay for the calender so 100% of your funds will go to the pumps. I also plan on making a hardcover book of my photos but this will take some time to finish. (Hopefully available middle of December 08). All the profits will go to the Good Water Fund. And if you would like, check out Savong's school at http://www.savong.com/.